Blissful Kitchen Vision | YAHpothecary | BE Sattvik! | BE Raw! BE’s highest intention is to nurture (through the medium of food and ancient wisdom) the divine and blissful nature that we are and to help to both energize and thus awaken, conscious eating practises that support the calming of the mind. We welcome the explorations of the highest vibrational, peace inducing and non-violent eating and drinking practices of monks, gurus, yogis, saints, medicine wo/men, herbalists, fruitarians, liquidarians etc. We are also the platform for supporting yogic meditation processes that work on incinerating unconscious food eating patterns plus those that support food-free lifestyles. We propose to imbibe and create an evolving seasonal food and drink menu and program platform inspired from the eastern Saatvik kitchens, veganism, Ayurveda, raw food eating, fresh food juicing and traversing the lacto-vegetarian traditions and cultures around the globe. We will house a pantry of primarily organic, non GMO, fair-trade, pesticide and herbicide free, low and gluten-free, nutrient-dense food options. BE’s Food Program will build community relationships with groups such as the Environmental Youth Alliance that inspires children, youth and young adults to connect with the natural world and become sustainability leaders in their communities. BE is an advocate of eating whole foods to grow whole bodies and thus wholistic thinking and action. We offer healthy menu planning and grocery buying to support the needs of single parents and low income families. BE Food Program will also develop, with the help a dedicated volunteer community, and create a menu to feed those without any means to purchase whole and wholesome foods through a Feed the Hungry Program called the Annalaya Project. BE has already planted their winter garden in the raised planter bed that hugs the north side of our Centre. We aspire to reclaim the wrap around yard space on Fraser & 20th Streets plus the public greens between sidewalk and street and populate it with bio-diverse flora and edibles that grow the lives of butterflies and bees. BE also has long term plans of growing an organic food acreage in Ladner. A potential where learning, gardening and zen living coincide. There is also a bus that awaits a new life as the “BE mobile kitchen” where we can serve a soup kitchen menu for the hungry or as a platform for fundraising through making and selling our BE Menu items. BE will also be home to a food buying cooperative. The food coop will supply the B.E. kitchen with primarily dry food staples to start to nurture its members and guests and be a platform for creating a greater food buying community within the neighborhood and beyond. The coop will be supporting the growth of organic small family growers both local and beyond. Buying in bulk together allows each of us to reap the best value and savings for our selves and families. BE is a vegetarian and alcohol-free community. The YAHpothecary: BE is excited to be home to YAHpothecary’s Ayurvedic Herb + Spice Shop, available after Nithyananda Saturday Satsang. All herbs are certified organic and include: Holy Basil/Tulsi, Haritaki, Triphala, Tumeric, Neem and Spirulina ~ pre-packed into half lb + 1 lb. bags. We will be offering Sattvik Indian Cooking classes with healing Ayurvvedic Spices. What Does it Mean to BE Sattvik? “You are what you eat” – What do we do with this knowledge? A sattvic diet, also referred to as a yoga diet or sentient diet, is a diet based on foods that (according to Ayurveda and Yoga) are strong in the sattva guna ( one of the key principles of Samkhya and Vedic philosophy), and lead to clarity and upeksa (equanimity) of mind while also being beneficial to the body. The gunas are the key principles of Samkhya and Vedic philosophy. The “sattva guna” comes from a Sanksrit word meaning “purity” or “existance” and relates to creation. Sattvic foods are pure, uncontaminated and meant to purify those who consume them. Such foods include water, cereal grains, legumes, vegetables, fruits, nuts, unpasteurized and unhomogenized fresh milk and fresh milk derivatives (mostly ghee, but also butter, cream, fresh or cottage cheese (paneer), and yogurt (lassi)), and raw honey. Foods that are considered the most sattvic of all are fresh milk from a happy cow (see the dairy section), and fruit fallen from a tree. This is because there is absolutely no harm done to the organism from which the nutrients came, but the organism gave the food willingly and with blessings. We welcome Candice of Frulution to BE to guide us in Raw and Sattvik Food Preparation. Enzymes in raw foods (such as amylases, proteases, and lipases) aid digestion. Heating food above 104-120 °Fahrenheit (40-49 °C) degrades or destroys these enzymes in food. Raw foods include bacteria and other micro-organisms that affect the immune system and digestion by populating the digestive tract with beneficial gut flora. Raw foods have higher nutrient values than foods that have been cooked. Processed food and convenience food often contain excitotoxins (such as flavor enhancers) that can cause excitotoxicity. Raw foods are the ideal, natural food for human consumption, and the basis of a raw food lifestyle. Wild foods followed by organic whole foods are more nutritious than conventionally domesticated foods or industrially produced foods. Raw foods such as fruits and vegetables are high in antioxidants. Vegetarianism is the practice of abstaining from the consumption of meat – red meat, poultry, seafood and the flesh of any other animal. It also includes abstention from by-products of animal slaughter (e.g., gelatin). Vegetarianism can be adopted for different reasons. Many object to eating meat out of respect for sentient life. Such ethical motivations have been codified under various religious beliefs, along with animal rights. Other motivations for vegetarianism are health-related, political, environmental, cultural, aesthetic or economic. The Academy of Nutrition and Dietetics and Dietitians of Canada have stated that at all stages of life, a properly planned vegetarian diet is “healthful, nutritionally adequate, and provides health benefits in the prevention and treatment of certain diseases”. Large-scale studies have shown that mortality from ischaemic heart disease was 30% lower among vegetarian men and 20% lower among vegetarian women than in non-vegetarians. 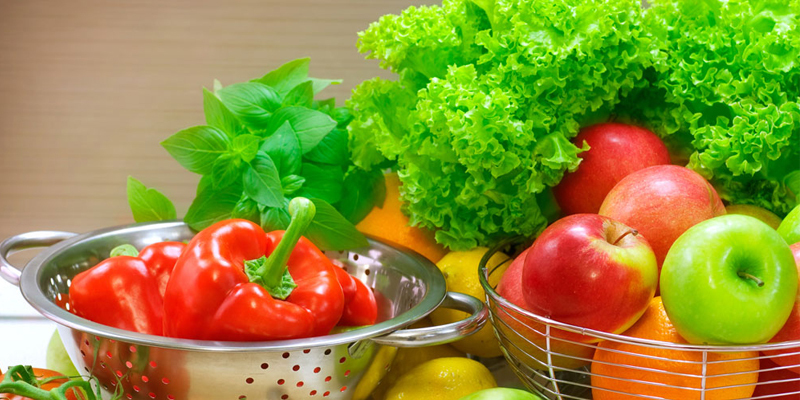 Vegetarian diets offer lower levels of saturated fat, cholesterol and animal protein, and higher levels of carbohydrates, fibre, magnesium, potassium, folate, and antioxidants such as vitamins C and E and phytochemicals. Vegetarians tend to have lower body mass index, lower levels of cholesterol, lower blood pressure, and less incidence of heart disease, hypertension, type 2 diabetes, renal disease, metabolic syndrome,dementias such as Alzheimer’s disease and other disorders. Restarting soon shortly, Single Mother Program participants will receive vegetarian/sattvic cooking lessons while simultaneously enriching their souls by offering their creations to the Downtown East Side. In a morning satsang, Paramahamsa Nithyananda (Swamiji) shares his vision for the world-wide Annalaya: free food for the hungry both spiritually and physically. Let the sangha create food and share, without waste. Wasting food is not only throwing away useful food, it is also dumping food into a stomach that is not hungry. A center is to be established in each city with free food for all who come and a library with free reading. The Shaivite lifestyle is sharing with the world. Nithyananda reminds his sangha that either God or Devil can be awakened in others. When devotees set the example of God with integrity and authentic goodness, the God in others is reflected back to them. Annalaya practices are all about sharing food and knowledge. For people who are are hungry for the truth, the Annalaya Project comes out of the Vedic tradition, in which food was used both for enriching and en-reaching. Bringing people together by sharing food is the foundation of this practice, which is driven by the vision that we create and share food without waste. To learn more about Paramahamsa Nithyananda (Swamiji) and his vision for the world-wide Annalaya, please visit the Nithyananda Annalaya website. The world-wide Annalaya projects comes to Vancouver to enrich, nurture and restore at Bridge & Enrich.